Whether you’re looking for a beach read this summer or a novel to curl up with on a relaxing night, here are some works from Asian American authors that we love. 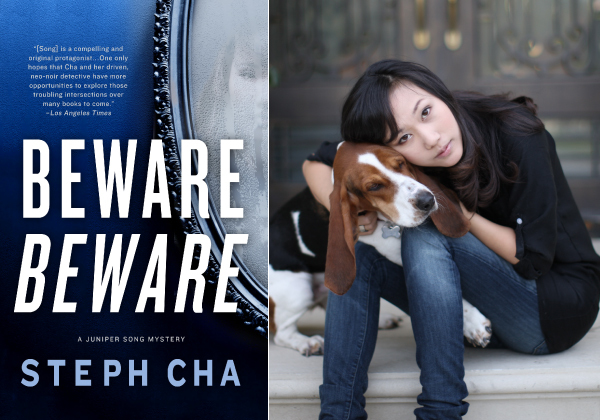 In Steph Cha’s sophomore novel Beware Beware—sequel to Follow Her Home—amateur sleuth turned private investigator Juniper Song is once again on the hunt for a killer. This time around, Song has been handed what appears to be a simple task: A worried girlfriend named Daphne wants Song to tail her freelance screenwriter boyfriend, Jaime. But when Jaime’s employer, movie star Joe Tilley, ends up dead in a hotel tub full of blood, Song knows that there’s clearly more afoot. Although Beware Beware might seem like a simple whodunit at first glance—and it’s certainly enjoyable as the typical murder mystery—for readers who like a bit more to bite into, Cha interweaves bigger questions of morality and right versus wrong into the story. The audience is challenged to decide: Can a killing be justified under certain circumstances? Either way, Beware Beware becomes a part-mystery, part-thriller that’ll keep you turning the pages. Readers of Jean Kwok’s Mambo in Chinatown travel to New York’s Chinatown for a story of family, self-awareness, and dance. Twenty-two year old Charlie Wong is a dishwasher who has never left the neighborhood and is content with her life of supporting her father and sister. But when she surprisingly lands a secretarial job in a prestigious dance studio uptown, she’s shown a whole new world and must reconcile her upbringing with her new opportunities. While readers may not identify exactly with Charlie’s Chinatown experiences, they can all appreciate her struggles when Charlie finds it easier to hide her job at a dance studio than tell her father. While the struggle to co-exist in both Eastern and Western worlds is a theme in many Asian American novels, Mambo in Chinatown is unique in the glimpse it provides into the intriguing world of dance—no doubt aided by Kwok’s own time as a professional ballroom dancer. For anyone who’s ever fought to stay true to family and culture while trying to find a unique identity, you’ll be encouraged to see how Charlie finds her own voice as well as her own love. The different ways people experience grief is what Celeste Ng explores in her debut novel, Everything I Never Told You. In the 1970s, a young half-Chinese girl, Lydia Lee, is found dead in a local lake in Ohio. As Lydia’s family struggles to come to terms with the death, readers see a range of reactions from embarking on a path that can destroy the marriage or seeking the party responsible for Lydia’s death, no matter the consequence. As Ng deftly paints a powerful yet tender portrait of a family torn apart, she simultaneously delves into the way culture and race change relationships as well. But the best part is that Ng subtly weaves all of this into the story, while avoiding clichés or a too-heavy tone. For an intriguing but very accessible glimpse into human psychology, this one’s got our seal of approval. To celebrate the launch of our Adventure issue, we’re giving away the books featured here in this Mochi Book Club column. Stay tuned for the details!